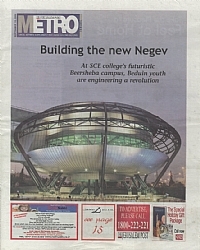 This building acts as an entry to the Negev academic College of Engineering in Be’er Sheva City. The 2,000 sq.m. structure consists of 3 lecture halls with a capacity of 110 students each, which open into a multi-purpose auditorium. Other facilities include a cafeteria, offices, a public gathering plaza under the building, and a garden. The round structure floating above the ground symbolizes harmony and togetherness. It is a pure steel structure, constructed of 8 V-shaped steel frames spanning 27 meters and is covered with aluminum strips and insulated glass.